The revolutionary Hutch app allows you to visualise your home in an impressive array of styles in just moments – truly the stuff of dreams for interior design enthusiasts. FORTUNE dubbed Hutch "a game changer for the interior design industry,” and we can see why. By using technology to rethink how people conceptualise and shop for home decor, the app gives even the most design-blind home owners the capacity to envision new styles and dream up beautiful interiors. Using Hutch's in-app templates, you can effortlessly begin to conceive your perfect apartment. Alternatively, you can take a photo of your own room – this is where it gets really cool – and Hutch will create a virtual 3D render of the space for you to work your magic on. The next step is reimagining the space through applying design filters which you can flick through seamlessly. 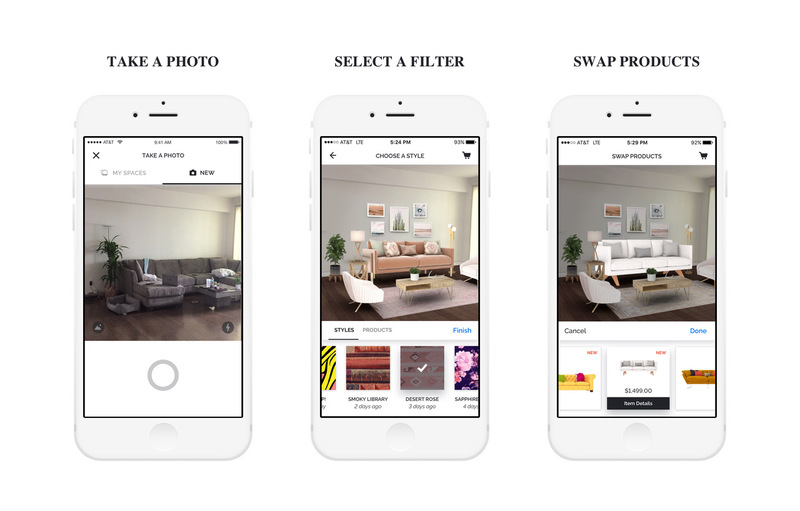 For example, if you choose the “Scandinavian Summer” filter, the app will fill the space with furniture and decor that fit the style and mood of the theme and coalesce beautifully. Other filters to explore include Malibu Luxe, Tropical Glam, Bohemian Goddess, Monochrome… the list goes on. And inside each style, you can swap and change any of the furniture for a long list of replacements until you have fully encapsulated your ideal apartment. But this isn’t just a dreamy app that puts indulgent designers at risk of falling in love with an intangible graphic of an imagined home. The icing on the cake with Hutch is that it is, in fact, a mobile-commerce business and every piece of furniture and decor you see is real and shoppable directly through the app. Beatrice Fischel-Bock launched Hutch in 2012 during her final year at university after coming to the realisation that interior design was an untapped resource in the technology sector. Now, Hutch are the fastest interior design service on the market, astutely targeting a tech-savvy generation. So whether you’re actually redecorating and need some interiors inspiration or designer decor and furniture are just a guilty pleasure, you'll find you can spend hours on Hutch – and probably a few dollars, too. Discover more of our lifestyle articles here.